Are you quite ready for spring to get here? Not that I’m complaining about winter! One of the things that I have really enjoyed since moving to Tulsa five years ago is that there is a much more well-defined season of cold weather than we experienced during our previous twelve years of living in the Dallas area. 250 miles further north does make a noticeable difference in average low temperatures, the duration of cold snaps, and the amount of snowfall each winter. As some of you know, I much prefer to grill out in cold weather as opposed to standing over burning charcoal when the outside air temperature is already 105° F. Whose idea was that? But, enough is enough, right? While spring does not officially begin until March 20, the transition back to Daylight Saving Time this Sunday and the local forecast for daytime temps in the low 70s on Monday and Tuesday have me itching for consistently warmer weather. There are signs that it is on its way. Daffodils have had their heads poked up out of the ground for a while now. They looked as if they were having serious second thoughts last week when they were up to their necks in sleet and snow, but I have a feeling that the next couple of weeks are going to see them rocketing up out of the ground. Ditto for the hyacinth in the landscaping behind our house. I noticed some greening of the grass (slight, but still significant) when I took a bag of trash out to the wheelie bin this morning. The same was true for the patch of grass outside my office window, and close inspection of the rose bushes in front of the main church office evidenced similar signs of new life. Bring it on! For those of us who are fortunate enough to live in a temperate zone and to experience the blessing of seasonal variety, spring always follows winter. Winter’s long nights are succeeded by extended hours of daylight in the summer. Warmth follows cold. God gave His word that it would always be this way until the end of time (Genesis 9:22). 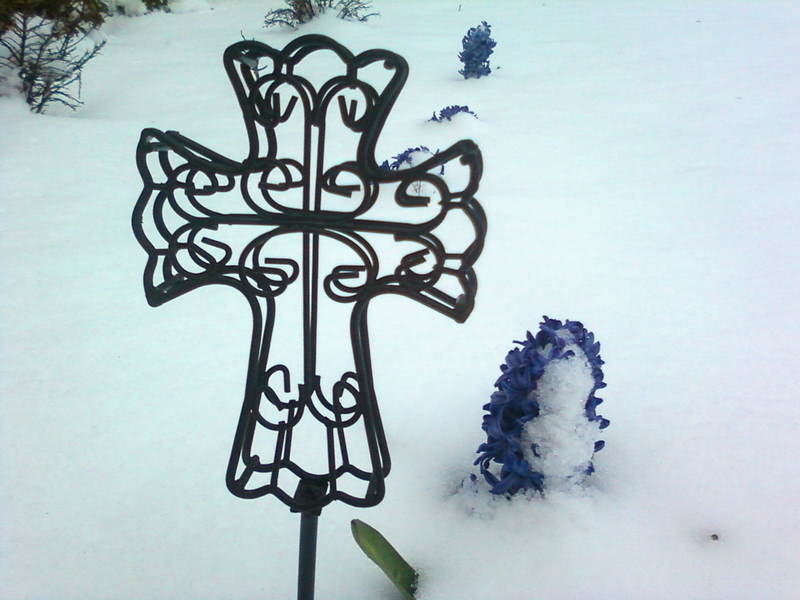 This promise of God not only relates to the changing of the earth’s seasons, but also serves as a powerful metaphor for the sustaining hope that can help us endure our spiritual “winters,” the seasons of emotional darkness that periodically shroud our hearts and minds, and the “long nights” of physical pain inflicted by chronic illness and disease. It’s real, and it hurts and disappoints, but it’s not forever! “For I consider that the sufferings of this present time are not worthy to be compared with the glory that is to be revealed to us,” (Romans 8:18). “For momentary, light affliction is producing for us an eternal weight of glory far beyond all comparison,” (II Corinthians 4:17). “Weeping may last for the night, but joy comes in the morning,” (Psalms 30:5). Whatever kind of “long winter’s night” you are experiencing right now, keep trusting and holding on to your faith in Jesus Christ “until the day dawns and the morning star arises in your hearts,” (II Peter 1:19)!